Zenoah G43L 41.5 cc 76 mm clutch rotor - 1.5"
Tanaka PF-4000 76 mm clutch rotor - 1.5"
Robin Subaru EH035 76 mm clutch rotor - 1.5"
Mitsubishi TLE43 or TLE33 76 mm clutch rotor - 1.5"
Huasheng 142F 49 cc Four Cycle 76 mm clutch rotor - 2-1/8"
.930" Drive Roller. 76 mm Clutch Rotor / 78 mm Clutch Drum / clutch bell. Friction Drive, Rear or Front Mount Kit. No Engine or Kill switch. 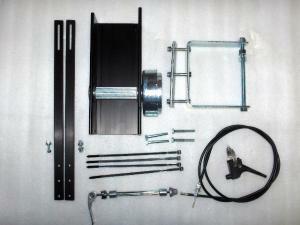 If you want a front mount kit for a trike be sure and click on the front mount kit. You may want to add the 6 Hole bracket Kit for wheels up to 28" or Front Mount Kits if you think you will need it. Engine or kill switch is NOT Included. CNC Machined, Heat treated and Zinc Plated with 3/8-16 Female threads. If you want LESS top speed, more pulling power for hills and bucking the wind pick a smaller drive roller. If you want a FASTER top speed, less pulling power on hills and bucking the wind pick a larger drive roller. Keep in mind the larger the drive roller you will have to assit pedal the bike up hills and high winds. One: Custom made 60" long throttle cable with the small lever & #16 mini hose clamp. Four: Nylon Cable Throttle Ties 8" long Black to secure the throttle cable and kill switch wire to the frame. The kill switch is NOT included. Be sure and add the type you want to the order. Two: ¼” x ¾” x 15.25” long Aluminum flat bar, CNC machined and Black Anodized. One: Spacer Engine for all our Friction Drive kits 76 mm Clutch Rotor CNC machined, made out of steel and zinc plated. This spacer keeps water and dirt from getting into the clutch rotor, more secure mounting of the engine and used for safety. One: 1/4" thick Aluminum Extrusion channel that is CNC machined and Anodized Black. We use one High Speed Double Sealed Ball Bearing on each side of the Drive Roller to support it and remove all the pressure off the engine. If you want to up grade the bearing that are Made in Taiwan, be sure and add it to your order. Rear mount kits will come with a 60" long throttle cable with the small black lever and hose clamp. If you have a Ladies Frame bike you will need approxixatly 68" throttle cable. Some folding bikes like the 20" Dahon need a 72" long throttle due to the way the frame and long up raise on the handle bars. Front mount kits should be put on Trikes only will come with a 30" long throttle cable with the small black lever and hose clamp. This kit includes everything except the ENGINE & KILL SWITCH. If you would like to order a kill switch, click on one of the links below to add them to your order. If you have a 1.60HP Engine and up to 280 lb. rider, mostly flat ground and some rolling hills the 1-1/8" drive roller is the one to pick. Lighter riders will take off faster and it will pull the hills better. You allways can pedal the bike at any time. Be sure and let us know if you have the Robin Subaru EH035, TANAKA PF-4000 Tanaka 33 & 35 cc, TLE33 33cc, or TLE43 42.7cc. This kit will also fit some of the China made engines with the same clutch rotor and bolt pattern as the above listed engines. Note: We can only make a throttle cable for the engines that we sell or know what type of throttle cable you need. If you have a China made engine or one that is not listed, you will get a cable and a #48 brass end for you to solder onto the cable. NOTE: This listing is for the .930" Drive Roller ONLY. If you need a different size, be sure and add the correct listing to the cart.